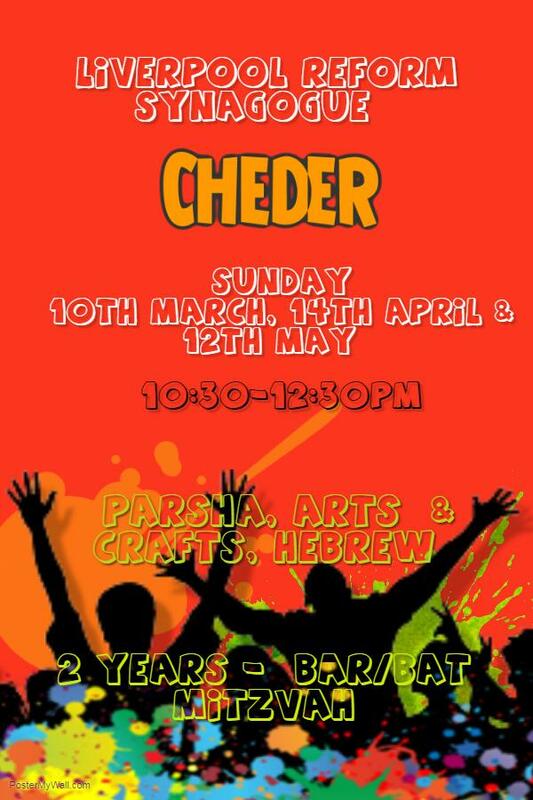 On 20th April, we will be holding the second night Seder in the Shul Hall. Rabbi Elf will lead the Seder. Booking Forms have been sent out to members and you should receive your copy shortly. If you are a member but have not received a form, it could be that we do not have your correct address, perhaps because you may have moved house. 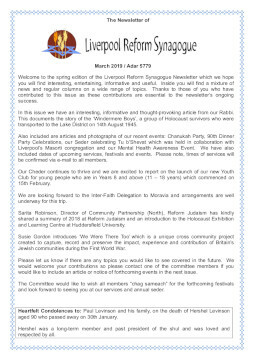 If you would like a form to be sent to you, please let us know by replying to our email address liverpool.reform.synagogue@gmail.com or leave a message on 07729 562174. In case you are able to print out a booking form, please click here to download a copy. 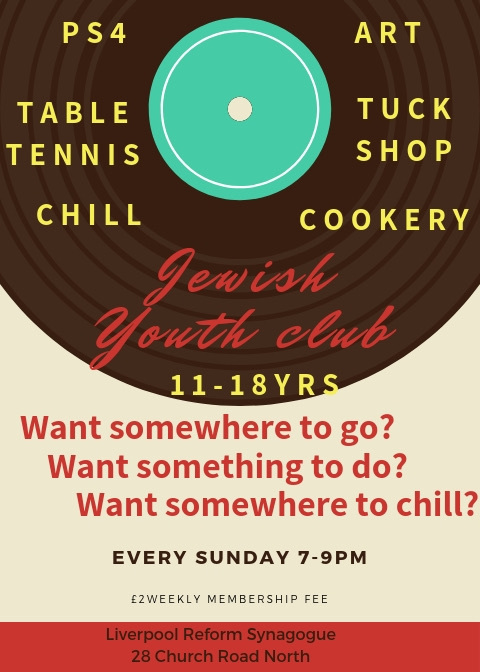 This is a brand new and exciting role through which you can give a voice to the Jewish Youth of Merseyside and play a major part in leading our community. You will help shape the community’s future too! In years 7 – 10 inclusive at any school in Merseyside. Able to take office for one school term. 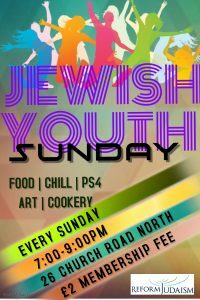 Willing to attend events, or to talk about what being Jewish means to you. You may have the opportunity to visit Liverpool Town Hall and meet with members of other faith groups. You MUST have the agreement of a parent or guardian and one of your teachers. A parent or guardian must attend any outside visit with you, for safeguarding reasons. Only one appointment will be made each term, but applications will be automatically carried over until the next school term. The closing date will be the last day of the school term preceding the appointment. The will be no interviews or elections, but we do want you to take some time to think about what you would bring to the role, and what you would like to do if appointed. Simply tell us in your letter – it’s as easy as that. Full details can be obtained by contacting Sara Radivan, Administrator, on 0151 7332292. Recruiting for our Fourth year Progressive Birthright Israel trip! Are you thinking of summer already? With great excitement we are happy to announce that Reform Judaism and Liberal Judaism are hosting their fourth Birthright Israel Progressive trip this summer on 28th August – 6th September! Birthright Israel refers to the not-for-profit educational organization (Taglit Birthright Israel) that sponsors free ten day trips to Israel for young adults. Reform Judaism and Liberal Judaism are lucky enough to have been able to collaborate with them to organise our own bus with leaders that we have chosen ourselves, as well as a programme that we are helping to organise. If you are between 19-26 years old, and haven’t been on an organised trip to Israel past the age of 18, you can apply now! Please visit: bit.ly/BirthrightIsraelUK2019 where there is a short form to fill in before heading straight to the Birthright Israel website. This form allows us to be able to contact you ahead of the trip. Feel free to ring Maya Skaarbrevik at 0208349 5661, or email info@jeneration.org. Nina Shackman is in the process of putting together the annual Shabbat Morning Kiddush rota. Liverpool Reform Synagogue is a custodian of a Czech Scroll from Prerov which a town in Moravia 20 minutes from the regional capital and location of the Jewish community in Olomouc. As part Jennifer Verson’s Doctoral Research at The Centre for Trust, Peace, and Social Relations at Coventry University, she is developing inter-faith services in Liverpool and Moravia. and inviting members of our Liverpool community to join two delegations to Prague, Olomouc and Prerov in 2019. These trips will develop new knowledge and understanding of how communities that care for Czech Scrolls can engage with local Czech communities to build inter and intrareligious peace. A Public Event which will last 30-40 minutes and will be developed by members of Liverpool Reform Synagogue Community using texts that are sacred to both the Liverpool and Czech communities. The event will remember the Moravian Jewish Community and will include songs and prayers from the Jewish liturgy in the 1800’s, Psalms in English, Hebrew and Czech, Poems in English and Czech and songs in Hebrew and Czech. It will be presented by members of the Liverpool Community with opportunities for participation. In the week before the delegation departs for Moravia will there will be a Liverpool sharing – place and time to be confirmed. Four Creative Sessions and Rehearsals starting from the last week of January times to be confirmed. Community members who would like to be part of the delegation will be supported to book affordable travel and accommodation for themselves in cooperation with other members. Members of the delegation can book collectively for a discount at Hotel Palac. There is an opportunity for dormitory accommodation at the Jewish Community. Please let me know if this interests you. Attend the sessions and rehearsals for the event in February!